Global icon Priyanka Chopra Jonas recently stepped out in a floral jumpsuit to attend Broadway remake of Pretty Woman. The Bollywood star who has also become a huge trendsetter matched the colour couture number with bright yellow high heels, which complemented her look and gave it a pop. The 36-year-old actor completed the look with hoop earrings and Violy water snake handbag designed by Ximena Kavalekas. PeeCee's blue and neon yellow floral outfit by Blumarine is perfect for summer. This all-in-one garment looks striking and can be statement-making. However, it isn't easy to pull off this item of clothing. The wong accessories or fit can spell disaster and make you never want to attempt this style again. However, there's no need to be intimidated, the right way to rock this look is like a fashionista. To do that, all you need is a few easy tips. Here's how you can recreate this look for any occasion. Choosing the right jumpsuit: When it comes to jumpsuits, there are a variety of options. The key to picking the right one for you is to first figure out if you are looking for something more casual or formal. Another thing to consider is whether you want it to be strapless or with sleeves. Once you've established those details you can focus on the details. The most flattering styles of all are jumpsuits that are fitted at the waist and loose around the legs. Formal occasions: While a dress may be an easy choice for a big event, ajumpsuit can have just as big of an impact. The right one can make you look polished and beautiful. Pick something that is well-tailored and chic. Pick accessories wisely. Don't go overboard. Sometimes less is more. 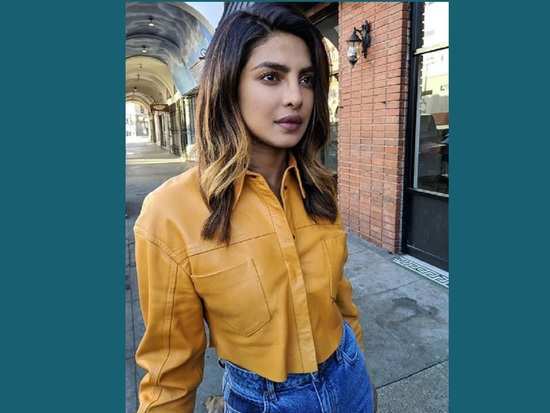 Jumpsuit with high heels: Like Priyanka Chopra Jonas, the right pair of heels is all you need to complete your look when opting for a jumpsuit. Another bonus is that heels can help make you look taller and leaner. Choose slim hells as chunky shoes could ruin your look and make you look like a hot mess (Ladies, you've been warned). Casual occasions: Pick a style that is comfortable and lose fit. Choose breathable fabric like cotton or light denim. You'll find a range of styles perfect for summer. Play with the colours and patterns if you are looking for a jumpsuit that all about streetwear. Jumpsuit with jewellery: Sometimes you can have a perfectly nice and simple jumpsuit that is plain. Bold accessories are great ways to up your style game and achieve casual chic vibes. Pick unique pieces that will stand out. 2Priyanka Chopra wishes her 'boss babe' Sophie Turner good luck for her show!